Disconnected editing in Collector for ArcGIS v10.2.2. Part 2: Go offline! My previous post which can be accessed here has guided you through some of the new features that had been introduced in the new Collector for ArcGIS v 10.2.2 release. The most important function that we considered was the ability to enable the disconnected editing workflow and the previous blog was all about the data preparation stage. Now that we’ve enabled a web map for offline editing it’s time to test this new functionality in the Collector for ArcGIS app. Let’s go through some of the major stages of the new disconnected editing workflow in Collector 10.2.2. 1. 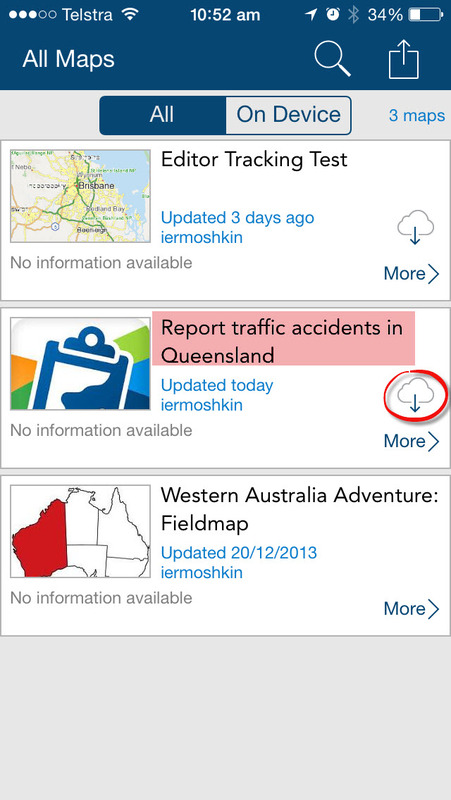 Open the Collector for ArcGIS app on an iPhone or any other supported mobile device. The map that was created on the DataPrep stage (discussed in the previous post) should be visible in the MyMaps list. Just to recap: I am still using the scenario with the traffic accidents that I will be capturing in remote areas using the Collector for ArcGIS app. This entry was posted in General and tagged ArcGIS Online, Collector for ArcGIS, editing, Mobile on April 28, 2014 by Ivan E.. Disconnected editing in Collector for ArcGIS v10.2.2. Part 1: Take your maps offline. How to enable disconnected editing on your Collector for ArcGIS maps. Esri Inc has recently released a new version of Collector which includes a few key updates, such as “offline” editing mode. Due to the positive feedback from our clients regarding the series of blogposts about the Collector for ArcGIS app that I published earlier this year, I decided to share some additional workflows and practices for use with the new version of the application that is now available for download. This entry was posted in General and tagged ArcGIS Online, Collector for ArcGIS, editing, Mobile on April 15, 2014 by Ivan E..
Christmas with Collector for ArcGIS: An In Field test. Part 3. In the previous post we looked at creating data, publishing feature services on ArcGIS Online for Organisations and setting up two web maps with different access levels. Now that we have two web maps – one for the general public and the one that allows authorised users to edit features, we can switch to the last phase of the workflow and use the Collector for ArcGIS application to edit the features. 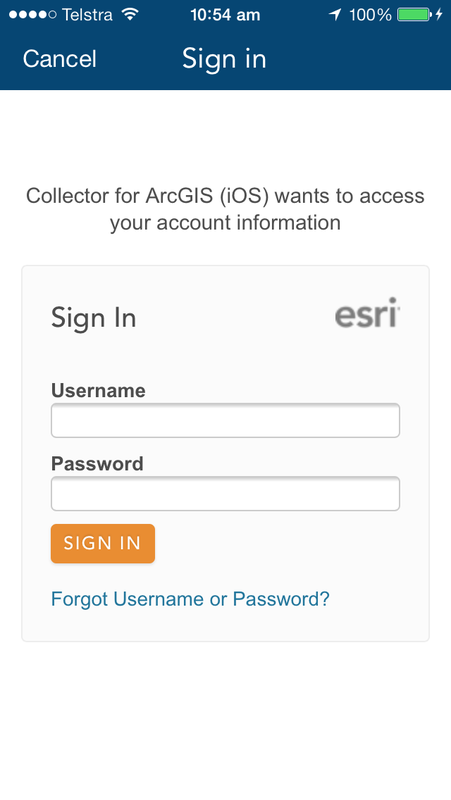 Once you’ve installed the app, run it and sign in to ArcGIS Online. This entry was posted in General and tagged ArcGIS Online, Collector for ArcGIS, Mobile on February 3, 2014 by Ivan E..